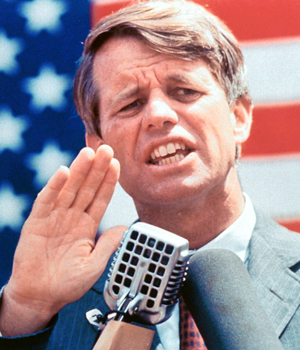 It was 45 years ago this week that Senator Robert F. Kennedy was assassinated by Sirhan Sirhan while celebrating after a victory in the California Democratic primary. It was another milestone event in 1968, following Martin Luther King, Jr.’s murder two months earlier. Although there is no way to tell how the election would have played out had Kennedy lived, we decided to look back at that presidential race and what the polling showed, and how the assassination resonated in the public’s mind. At the time, Kennedy was fighting in a close three-way race for the party’s presidential nomination. In a nationwide Gallup poll the week before Kennedy’s assassination, Vice President Hubert Humphrey narrowly led Kennedy, 34% to 28%, with Sen. Eugene McCarthy receiving 26%. 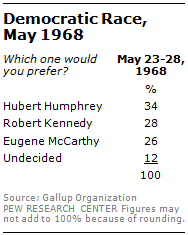 Among Democrats, the split was mostly between Humphrey (40%) and Kennedy (37%) with McCarthy further behind at 16%. Much of Kennedy’s support came from younger people. In the three-way race for the Democratic nomination, Kennedy had the backing of 37% of those under 30, compared to 26% of those older than 30. That same poll showed a dead heat in a hypothetical general election matchup between Kennedy and former Vice President Richard Nixon, with Nixon at 37%, Kennedy at 35% and third-party candidate George Wallace at 17%. 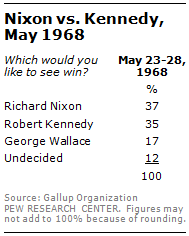 Adults younger than 30 would have picked Kennedy over Nixon, 44% to 33%. After Kennedy’s death, Humphrey went on to win the nomination in a contentious intraparty battle; he lost to Nixon handily in the Electoral College, but by less than 1% in the popular vote. The assassination captured the nation’s attention, with 90% of the public later recalling that they saw the event “at about the time” it happened, according to a 1992 survey by the Times Mirror Center for the People and the Press. 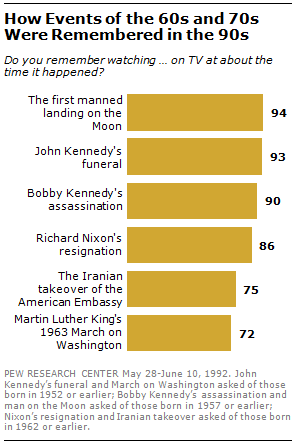 Among people who were born in 1957 or before, the assassination of Robert F. Kennedy, the Moon landing and the funeral of John F. Kennedy (born in 1952 or before) were recalled by virtually all of those old enough to remember the events. The public was also intrigued about rumors of a conspiracy theory surrounding the assassination. A 55% majority of the public said they thought the murder was “part of a broader plot or conspiracy” in a 1978 Harris poll (34% said it was just one man and 11% were not sure).